U.S. stocks slid deep in the red Wednesday, as eurozone fears rumbled on and a preliminary report showed that Chinese manufacturing slowed sharply. An lackluster report on the U.S. job market added to the gloomy mood on Wall Street. 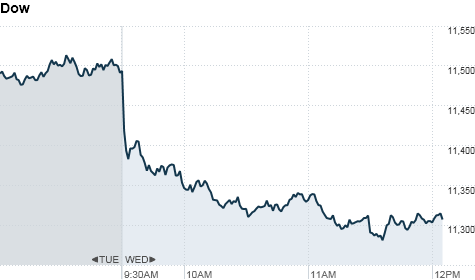 The Dow Jones industrial average (INDU) dropped 180 points, or 1.6%. The selling was broad, with all 30 components of the blue chip index losing ground. The S&P 500 (SPX) dropped 20 points, or 1.7%, and the Nasdaq (COMP) lost 47 points, or 1.9%. Investors were rattled by a disappointing auction of German bonds. The debt of Europe’s largest and most healthy economy is often considered the gold standard of eurozone sovereign debt, and yields have managed to hold near record lows. But the dismal auction results raise concerns. The European Commission published a green paper on stability bonds Wednesday to help allay those worries, outlining proposals to fix the eurozone’s debt crisis. However, skepticism remains about how effective these plans will be. Meanwhile, Chinese manufacturing activity fell to a 32-month low, heightening fears that the eurozone’s problems are spreading beyond Europe and added to worries about a global economic slowdown. In the U.S., unemployment insurance claims ticked higher during the latest week, and the savings rate rose, meaning that consumers might be putting a break on spending. Stocks have taken a downward turn in recent sessions, as rising bond yields in Italy and Spain continue to shake investor confidence. Stocks ended in the red Tuesday amid worries about U.S. economic growth, though losses were trimmed after the International Monetary Fund unveiled a beefed-up lending program to help otherwise healthy countries with short-term financing problems. World markets: European stocks closed sharply lower. Britain’s FTSE 100 (UKX) slipped 1.3%, the DAX (DAX) in Germany ticked down 1.4% and France’s CAC 40 (CAC40) slid 1.7%. Asian markets ended in the red, after the report that showed Chinese manufacturing output fell to the lowest level since March 2009. The Shanghai Composite (SHCOMP) ended the session 0.7% lower and the Hang Seng (HSI) in Hong Kong tumbled 2.1%. Japanese markets were closed Wednesday for holiday. Economy: The government released several economic reports Wednesday including jobless claims, personal spending and income, and durable goods. The number of people filing for initial unemployment benefits rose 2,000 in the latest week to 393,000. Analysts surveyed by Briefing.com expected 391,000 jobless claims for the week ending November 19. Personal income climbed 0.4% in October, while personal spending grew 0.1%. Analysts had expected both measures to rise 0.3%. Meanwhile, orders of durable goods slipped 0.7% in October — slightly less than the 0.9% drop economists had been expecting. Companies: Bank of America (BAC, Fortune 500) shares slid 4%, and briefly touched the lowest level since March 2009, after a report in The Wall Street Journal on Tuesday stated the bank was having difficulty meeting U.S. financial regulatory requirements. Late Tuesday, the Federal Reserve also ordered the top 31 U.S. banks — with assets of $50 billion or more — to participate in stress tests that will simulate another financial crisis. Tests will simulate a more severe global financial meltdown for six banks with the largest trading operations: Bank of America, Goldman Sachs (GS, Fortune 500), Citigroup (C, Fortune 500), JPMorgan Chase (JPM, Fortune 500), Morgan Stanley (MS, Fortune 500) and Wells Fargo (WFC, Fortune 500). Shares of many of those financial giants took a hit Wednesday. JPMorgan Chase, Citi and Morgan Stanley shares all dropped more than 2%. Shares of Groupon (GRPN) tumbled 14%, to $17.20 a share — well below its initial public offering price of $20. The Internet deal site’s stock has been pummeled this week — along with other newly public startups like LinkedIn — on renewed dot-com bubble concerns and worries of overvaluation. John Deere (DE, Fortune 500) reported full-year earnings that hit a record $2.8 billion, and posted fourth-quarter net income that blew past expectations. Shares of the equipment maker climbed more than 3%, making it one of the strongest performers in the S&P 500. Oil for January delivery slipped $1.53 to $96.48 a barrel. Gold futures for December delivery fell $13.20 to $1,689.20 an ounce.